This is absolutely beautiful. Looks to be in remarkably good shape too! Congrats! I loved those old TLRs. Uses 120 film, right. Big negatives! I ran some film through this bad boy today. They were pretty good, but there was a halo/glow effect around highlights and a general fogginess across the negative. I took a closer look at the taking lens and saw a ton of oil deposits from the shutter (apparently a common problem with Yashica TLRs). I removed the front bezel and the front element of the taking lens, opened up the aperture, held the shutter open with a duct-taped release cable, and swabbed the gunk off the front of the rear element with some Q-tips and naphtha. It looks like this crud has been building up awhile and has etched the lens element a bit, but it is still far clearer than it was before (I couldn't get all the oil off the outer edge of the lens, but I can't imagine a little bit out there would hurt too much). I'll run some more film through tomorrow. That brown neckstrap look really good! Where did you get it? 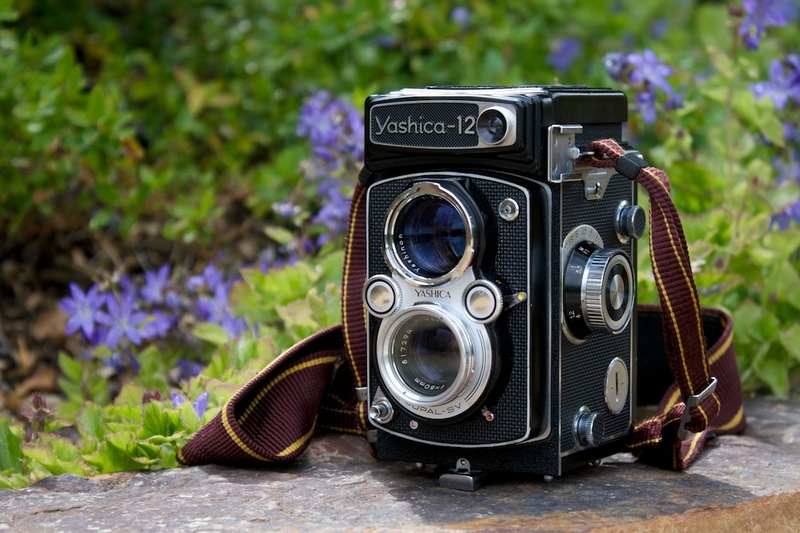 I'd like one similar for my Yashica 635.
i've got one.. given to me by my mom from her grandfather.. hope its still running..
is the battery still available?